If we want to improve people’s health we have to know both where we stand now, but also be able to track our progress. 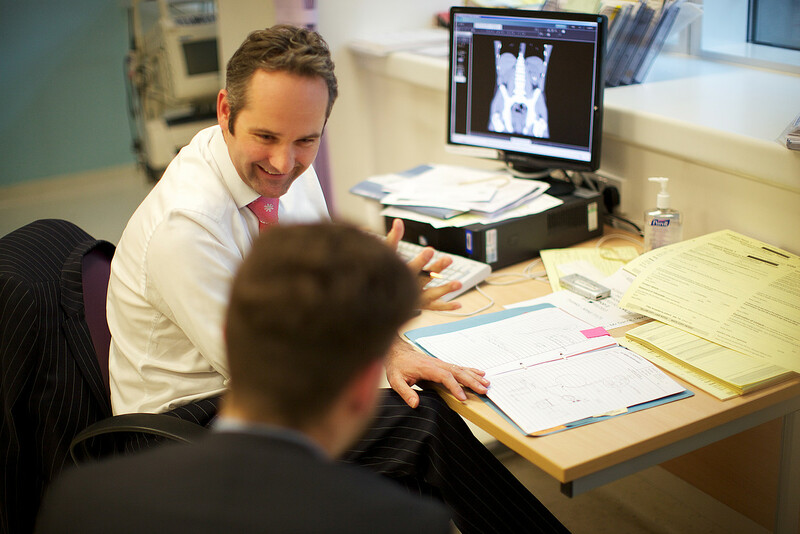 At PHE, we have a wealth of data on a wide variety of health topics. Part of our challenge is to update it, make it available and most importantly make it available in a way that’s accessible and easy to use. One of the most powerful ways we present public health data is through the Public Health Outcomes Framework (PHOF) which we update every quarter. What does the PHOF include? The PHOF covers the full spectrum of what we understand as public health. It's designed to present local authority data for many different health indicators and their determinants but can also be used to track national progress. There are 67 indicators in total, but some indicators consist of a number of sub-indicators. These range from inequalities in life expectancy, wider determinants of health like homelessness or readiness of children for school, through to smoking prevalence, screening coverage, people presenting with HIV at a late stage of infection, TB incidence and suicide rates. What did we learn in this update? 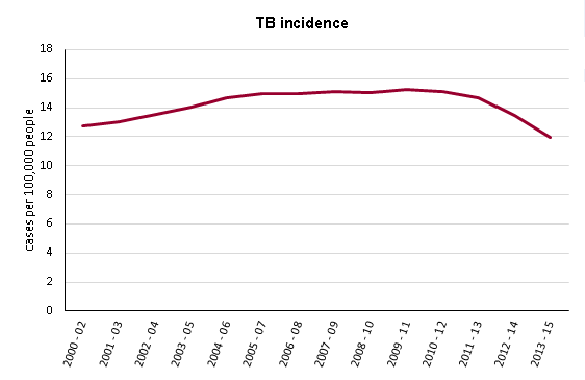 The rate of new TB cases in 2013-15 fell to its lowest level for more than a decade. This is good news, but it’s important to remember that there is wide variation in the incidence of TB by local authority. For example, Newham has TB incidence over 7 times the national rate. You can find out more about the variation in TB and the work being done in Newham to improve these numbers in our latest edition of Health Matters - reducing the burden of tuberculosis. 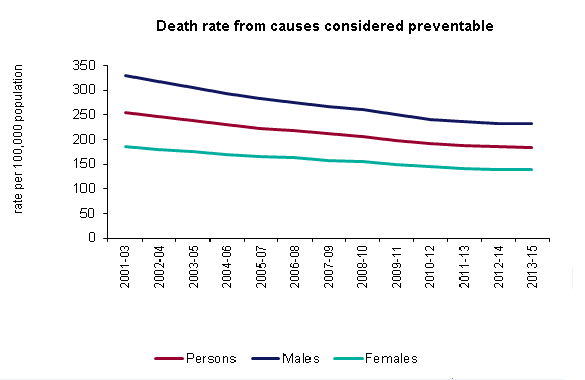 The death rate from conditions for which all or most deaths can be prevented by public health interventions (diet, not smoking, exercise, injury prevention etc) decreased slightly during 2013-2015. This was not a statistically significant reduction, although it was the 12th consecutive decrease since 2001-2003. This consecutive reduction occurred for both males and females, but the rate overall for males is significantly higher than for females. 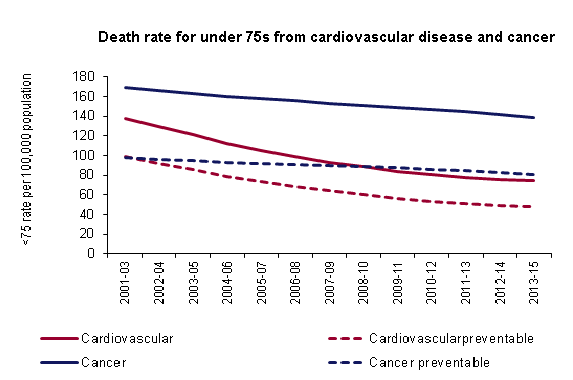 Cardiovascular disease and cancer are two of the major causes of early death in England. The death rate in under 75s fell significantly for cardiovascular disease and cancer both overall and from the specific causes that are considered preventable. This continues the trend in decreasing rates of death from these conditions for all periods in PHOF, which show 12 consecutive decreases since 2001-03. Detecting HIV early is important as it hugely improves chances of survival and reduces the spread of the virus. 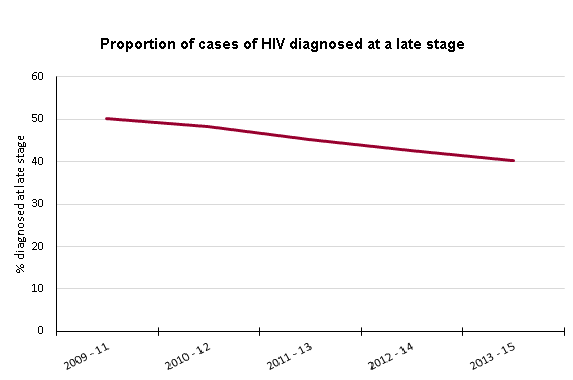 This is the fourth period of consecutive decline for HIV late stage diagnosis since it was first published in the PHOF. However, the proportion still stands at 40.3% and the goal for this indicator is for less than 25% of cases to be diagnosed at late stage. 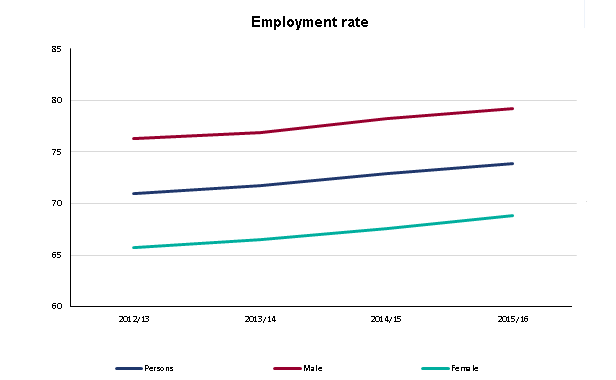 The overall employment rate for those aged 16-64 increased significantly to 73.9% in 2015/16. However, those with long-term health conditions are less likely to be in employment, with an employment rate of 8.8 percentage points lower than overall. You can read more about the relationship between health, work and worklessness in our blog. 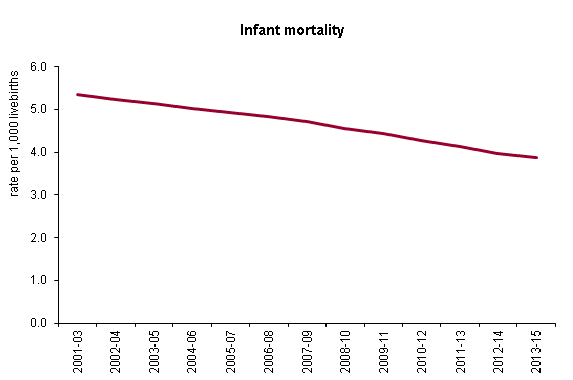 The rate of deaths in infants aged under one year decreased during the period 2013-15, although this was not a statistically significant change. However, this is the 12th consecutive decrease since 2001-03. 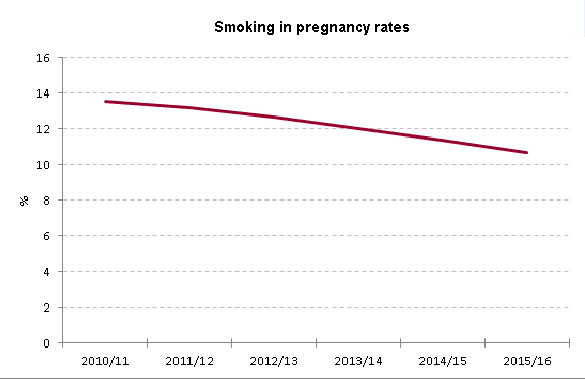 In 2015/16, smoking prevalence in mothers at the time of delivery was 10.6%, which is a significant improvement and the rate has continued to fall from 2010/11, when it was 13.5%.